Mercury Racing introduced at 400-HP Verado outboard. Mercury Racing introduced a 400-HP Verado outboard. 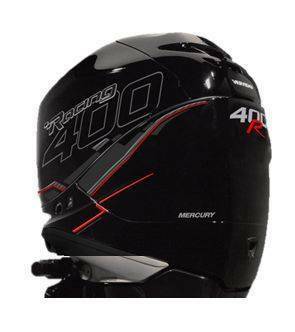 -Mercury Racing introduced their first 400 HP outboard. This is a jazzed-up Verado, which actually spins a whopping 7000 RPM and utilizes a number of beefier parts, improved knock sensors, and new mapping in the “brain”. Merc also rolled out a production 350 Verado (formerly available from Mercury Racing, only). -Volvo Penta broke news with their new “Forward Drive.” This is a somewhat bizarre-looking amalgamation of pod drive and stern drive; it bolts onto the transom of the boat, just like a stern drive, but the props are forward-facing, just like a pod drive. What’s the point? Wake-surfers and other watersports enthusiasts don’t have to worry about falling into spinning meat-cleavers, because all of the moving parts are up underneath the hull. -Hydra-Sports introduced their new 53 foot, quad-engine center. Ummm, yes, we did say 53 foot. Is this now the biggest center console in existence? Quite possibly. The official maximum horsepower rating: none. -Raymarine showed off their Dragonfly 4-DV You may remember the original Raymarine Dragonfly, which won an NMMA Innovations Award last year at the show. For 2015, they’ve shrunk it down into a much smaller unit, that costs a whole lot less—MSRP is a mere $200. -Apex Marine introduced their center console pontoon boat, the Angler Qwest. From the waterline down it looks like a pontoon boat but above the rubrail, you’ll find a center console, livewell, a T-top worthy of a canyon-runner, and oodles of rodholders. Yeah, this one’s tempting, alright!